So I was watching the following video on YouTube the other day about Chaos and the Butterfly Effect (see below). Its really quite pretty. You can play around with it your self here or, if you prefer, you can try the WebGL/Plugin free version here (tho you will need a recent version of Chrome or Firefox). — Be using a PC that exceeds the recommended system specs. — Run the game in windowed mode, with Graphics Quality set to “Low”, at a resolution of 800×600. — Host a game and leave it running. — Run another instance of the game, this time select your desired quality settings and resolution, and run in full screen if desired. — Use this second instance to join the game. When hosting a server problems can arise due to any installed firewalls and/or you router. If others are having problems connecting to a server you are hosting check to make sure that you have allowed S.W.A.P. through your firewall and if necessary configured port forwarding on the router (by default S.W.A.P. uses port 8888). You can find further information on how to setup post forwarding for you specific router here. The SwapBot Elite Facebook page is a place where fans of S.W.A.P. can hangout, organize games, provide feedback and generally discuss S.W.A.P. It is also where us Developers announce new releases and share other S.W.A.P. News. The Official play tests are called “Swapathons” and are run most Sundays at 8.00pm AEST. A video of S.W.A.P. Gameplay on the Rugga level. The video was recorded on a pre-release version of the 0.9.14.0 Beta release. Enjoy!! // work out angle between us and the target. float rotAmount = Mathf.Clamp01( maxTrunAmount / angle );	// this prevents us from rotating more them the maximum allowed!! So the goal of this function is to rotate the missile so it faces the target. However the amount it can rotate is capped by maxTrunAmount. The problem was that if you got the distance and angle right the missile would need to rotate more then maxTrunAmount would allow it to. If you got this just right this would result in stable “orbits” where the missile would just keep circling the target. Needless to say this actually works quite differently. This time, in addition to tracking the target we also wanted to adjust how far the missile could turn, when it was right at the end of its tracking range, it would turn only a small amount. As it gets closer it can turn faster, When it gets really close it will got straight for the target. On line 8 we work out how close we are to the target as a percentage (0 being far away, 1 being at the target). Note that we take 2 away from our max tracking distance, this is to take into account that the targets position is in the centre of the avatar and for this number to ever be 1 we must get to a distance of 0. Because of the Targets collider (and the missile’s too) this is impossible, so we have minus 2. By eliminating the artificial maxTrunAmount we have allowed the swap missile to (eventually) turn the full required amount to actually hit and eliminated the “orbits”. (of course if I couldn’t fix it we would have ended up with swap Sharks instead, which could have been fun :D). 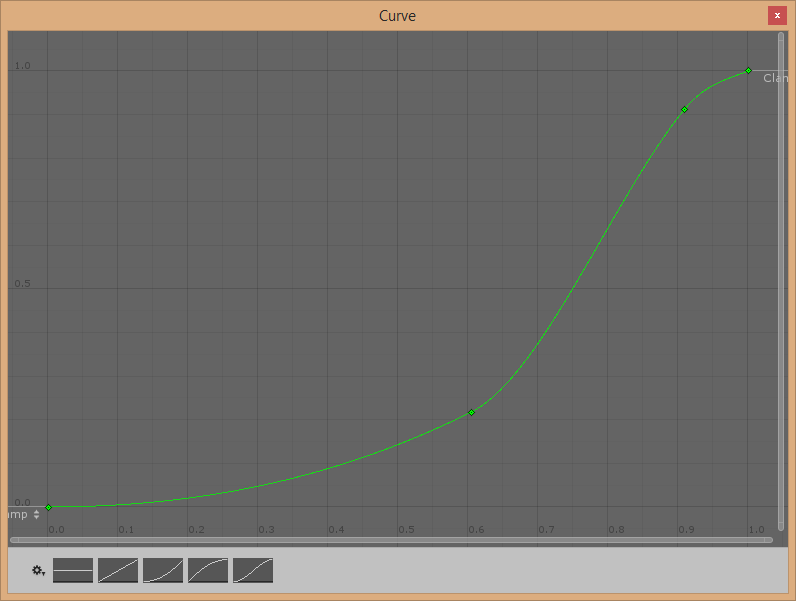 Actually the single best thing to come out of this was my learning about the AnimationCurve.Evaluate() function. It makes it trivial to expose a curve in the inspector which can be edited by an artist and then use it to control a lerp between two values (colour, position, rotation , whatever). This actually allows me solve one of the most frequent questions I get from an artist when I setup a mechanic that involve a lerp, i.e Can you change it so…? Now I can just tell them: Do it yourself! and that always make me feel good. A video/slideshow showing S.W.A.P.’s development from the original concept art and pitch video to its current state (as of version 0.9.8). If you want to know more about S.W.A.P. or play the game you can do so here. Or you can find out about its debug console here. When we were developing the original Prototype for S.W.A.P. we ran into A LOT of problem, by far the worst of which was encountered on the afternoon the day before our deadline. With more then two players in the game there would be ‘ownership’ issues after a players swaps, i.e. two players would control the same avatar. In the end this bug forced us to rely on a video when pitching the game, instead of a live demo. With the recent release of Unity 4.2 the free edition has finally gotten the same version control features as the pro version (at least in regards to external version control, integration with the unity editor still requires Pro + a Team license). This post explains these what these features are, how they work and how to use them. Before I get into Unties version control features I’ll provide an overview the anatomy of a unity project. Root: In addition to containing the folders described below the root directory of a unity project also contains the MonoDevelop/Visual Studio project/temp files. Unity generates these files for us automatically and so can generally be ignored by us. Assets: The assets folder is where all your game assets are stored, including textures, materials, meshes, scripts, sounds, prefabs, scenes, etc. ProjectSettings: This folder contains a series of text files corresponding to Unities project settings (Edit->Project Settings in the Editor).Library: contains metadata and cached data about the projects asset library. When you change the options of a game object or add a component in the inspector that information is stored here in binary format (at least in unities default configuration).